Recruiting is a major activity for MBA students and networking with firms is important. 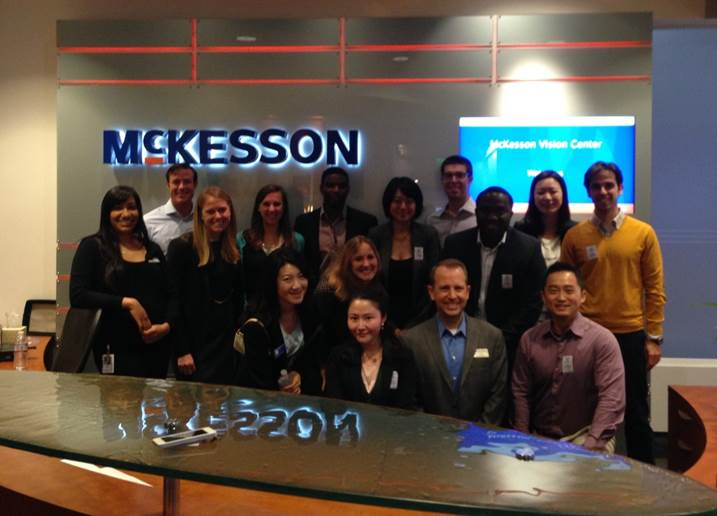 During term breaks, the Fuqua Health Care Club (HCC) organizes treks where Duke Health Sector Management (HSM) students visit companies together. We call these treks "Week in Cities". They are a structured way for students to learn more about the companies that they are interested in and meet alumni who are working in relevant functions post-MBA. It was also a fantastic opportunity for 1st year bonding! I got to know a lot of my classmates better through going on this trip together. So far we've had 5 Week in Cities trips that focused exclusively on health care companies in 2013. During the fall break (Mid-October, sandwiched in between the Fall 1 and Fall 2 terms) the Health Care Club organized two treks, one to California (L.A. and San Francisco) and the other to the North East (New Jersey and Boston). The California trip focused more on providers, biotech and startups, whereas the North East trip focused on pharma and consulting. It was a 5-day trip, starting on Sunday, and ending on Friday. Company visits took place on every day except for Wednesday, which was used as a travel day and had no planned company visits. I chose to do the California trip exclusively, although some classmates mixed it up and did half of each trip. During the same week, there are also other treks organized by Fuqua clubs such as consulting, high tech, etc - many HSM students joined other clubs' treks for half the trip and rejoined with the HCC for the other half. It's really flexible and students can plan their travel according to the companies they want to connect with. The visits to companies were eye-opening and gave us a view from the inside. A typical company visit will include a panel with previous Fuqua alumni who graduated a few years ago, a session with senior leadership and networking. Companies may sponsor lunch or a happy hour later in the evening. These meetings were a great opportunity to hear from employees on what it is like to work at these firms and for students to ask questions. We've had surprise visits from executive leadership at these companies, and yes, that has even included the CEO. The HCC organizes students to do advance preparation on the companies prior to the visit. Each person would be responsible for doing research for one or two firms and share the results with the rest of the group. Some firms may also have a case that they'd like us to read ahead of time and use it for discussion during the visit. Overall it was a very educational experience and gave us insight on what is at the cutting edge for the industry and how leading firms are thinking in this exciting health care environment. Fuqua is very student-led, and we've organized two other non-HCC Week in Cities treks. One of them was to the Mid-West and another was our inaugural Europe trip during winter break. The trip offered networking opportunities at many global pharma company headquarters and regulatory agencies, many of which we study extensively in our health care classes. I couldn't go, but the feedback I got from students who went was that they had a fantastic time. The Week in Cities trip to Washington D.C. is organized by faculty at the HSM program and students are given course credit. During Fall term 2, students have a weekly lecture series that goes deeper on regulatory issues central to health care. During the winter break, students travel to Washington D.C. to meet with regulators, companies, and think tanks to further learn about and discuss these issues. A question I get asked often from prospective students is whether Duke's location in Durham, NC puts MBA students at a disadvantage because of this. This has definitely not been the case. The Week in Cities trips offered us an opportunity to visit and network with firms. This is especially the case for health care, as Fuqua enjoys significant alumni representation at these firms and networking is easily facilitated through these strong relationships. This is part of a blog series on health care opportunities outside of the classes and seminars. I wrote this series because a reader asked, so please leave your questions and comments on the blog! How do you like these blog posts? Would appreciate your feedback in the comment section below! Hey Steven, As always, great post. Thanks for bringing this topic up. I was aware of these trips made by Fuqua and I always used to wonder how much can you accomplish in one visit. I absolutely get that this is a great chance to meet and network with Fuqua alumni at those organizations, but, can we really get a sense of the culture of the organization just by visiting it once? Whats your experience in this regard? In my experience, geography can be a big factor for a school's alumni base. What you can do is go on LinkedIn and see how strong the alumni for each school is at your target companies. You can also reach out to current students at the other programs and see how they're able to leverage their local resources and relationships. However, if you're trying to network with bay area folks, being local would definitely help facilitate relationships through Meetups, conferences, etc. These are great questions to ask current students at the programs you're interested in and learn how they've leveraged their location to build relationships. Regarding your first question, biopharma firms interact with Fuqua students on multiple occasions and at multiple levels. Usually there is a corporate presentation followed by office hours and happy hour at a local bar for students to learn about and interact with the company and its people. Some companies will host other events (case studies, panel discussions) to engage with Fuqua students. Students are also encouraged to set up informational interviews with alumni. Overall, there are multiple channels and avenues for Fuqua students to learn about a company's culture.